Painting a Room Blue attempts to store the sky for a year. 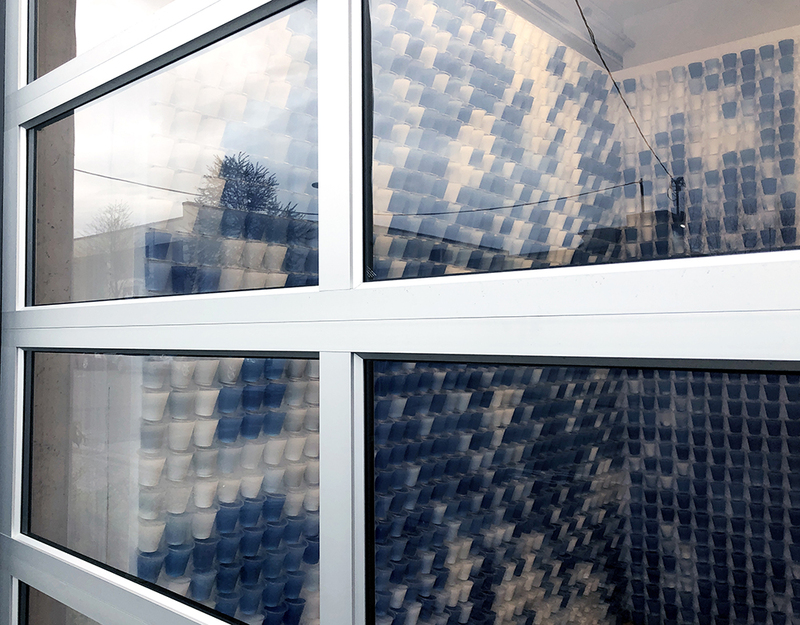 It consists of over 4000 plastic cups that line the floor and three walls of the gallery’s project space The Garage. In near perfect order, each vertical container is meticulously secured with one thin nail. Matched through historical weather reports from the 365 days prior to the exhibition, each cup contains acrylic paint and water mixed to correspond to the colour of the sky on that particular calendar day. They appear sequentially from April 3rd, 2019 to April 3rd, 2018, left to right, repeated. The gallery walls have been constructed within a permanent concrete room. They float below the ceiling and, as a result, the barrier between the structure is exposed. The cups conform to the room’s limitations, or as Achtem puts it: “[like] standing at the river’s edge, or shoreline, the merging of two points.” The room is visible only from outside the gallery and a large rolling glass door creates a boundary between the viewer and the art work, much like a window display. The work has a quaint beauty and seductive quality to it that will only be made more palpable as the exhibition ages. It separates itself from painting and the gesture of the hand by allowing time to do the mark making. As the water evaporates, a blue sedimentary pattern will leave traces of the paint’s pigments, similar to the layers and tints found naturally in the mineral cobalt. Throughout this slow residual process, the work will also grow mold. Achtem plays on the uninhabitable quality of The Garage with her earthly interests: as air and light effect the installation, an ecosystem is created that ultimately pushes the ephemeral work to a place where it becomes a health hazard. A couple weeks ago, I happened to reread Maggie Nelson’s book Bluets and soon after learned about Achtem’s exhibition. The association was serendipitous, because for each, the colour blue is also a continual theme. As with the feeling of longing, it is all encompassing. On the West Coast, grey is a constant. We know this, we accept this, yet it never ceases that when our inner longing for a blue sky is fulfilled, our entire being is renewed. The transition from grey to blue in Achtem’s work relies on similar intricacies of the psychological realm and the inevitability of emotion. Alex Achtem: Painting a Room Blue continues until May 25. Justina Bohach facilitates various modes of cultural production within contemporary art. She has published with Blonde Art Books, The Mainlander, C Magazine, and Canadian Art. She is currently part of the curatorial team at the Vancouver Art Gallery. She is Akimblog’s Vancouver correspondent and can be followed on Instagram @then.on.second.thought.